Hospitality is an overused word – what should be a tailor-made experience often comes from a cookie-cutter mould. Not so in the hands of Annica and Marie Eklund, for whom the art of entertaining has always had a personal touch. It's a cold and windy February night and the streets of Stockholm are empty but for a few people hurrying to catch the post-rushhour train. Sweden is an inhospitable place in winter. Even natives are aware of the moodaltering effects of months of short days and long nights. Yet in the distance, far down Kungsgatan, the glowing torches outside of Theatre Oscar beckon. Inside, a warm welcome instantly puts you in a happier place. The theatre’s lobby has been transformed into a dressing room where guests are encouraged to don hats or feather boas. For tonight only, the stage is not a setting for a play, but rather an elaborate dinner hosted by Bolon. Since Marie and Annica Eklund took over the family business in 2003 they have made events such as the Theatre Oscar dinner a trademark of Bolon – carefully curated happenings that are unlike anything you might experience in the corporate world. It makes sense, then, that the sisters are now turning their hand to hospitality in the real sense of the word. Urban House is based in a 19th-century warehouse in the middle of Ulricehamn. Despite its small-town setting, the space has the feeling of a downtown Manhattan loft, with exposed brick walls and large windows that offer views towards the nearby lake. The six bedrooms are all decorated individually and feature bathtubs and vintage furniture sourced from the trips that Annica and Marie take every year. “We are involved in all aspects of the interior design and if we hadn’t been, I don’t think it would be the same,” says Annica. “It’s the small details that make it. The playfulness that we experience in certain places when we travel is what we bring home and recreate in Urban House. “Look around the space and you will spot a vintage French travelling wardrobe, complete with its original labels, as well as a chandelier picked up during a trip to Rio de Janeiro. Urban House stands as a visual record of its proprietors’ experiences. VILLA LA MADONNA, which is part of a vineyard and covers a small estate in the rolling hills of Piedmont, possesses a different atmosphere. There is a yoga studio in a barn, neat rows of grape vines, an outdoor kitchen and a 400-year-old wine cellar protected by Unesco’s heritage list. “The heart of Villa La Madonna is the kitchen, the wine and the beautiful landscape with its rich traditions,” says Marie. “We want to create a place where our guests can relax and experience Piedmont.” It’s a retreat designed for guests to escape the daily grind. Instead, visitors are invited to partake in the annual harvest, learn to cook the local cuisine, or simply enjoy the views from one of the hotel’s many terraces and let their minds wander. A key component of the guesthouses is Bolon flooring itself and the interiors often serve as test grounds for new collections and ideas, giving guests a feeling for what it’s like to have Bolon in their environment. “We like people to experience something that we have created, and by using Bolon in these contexts we inspire people to see and use Bolon in different ways,” says Marie. 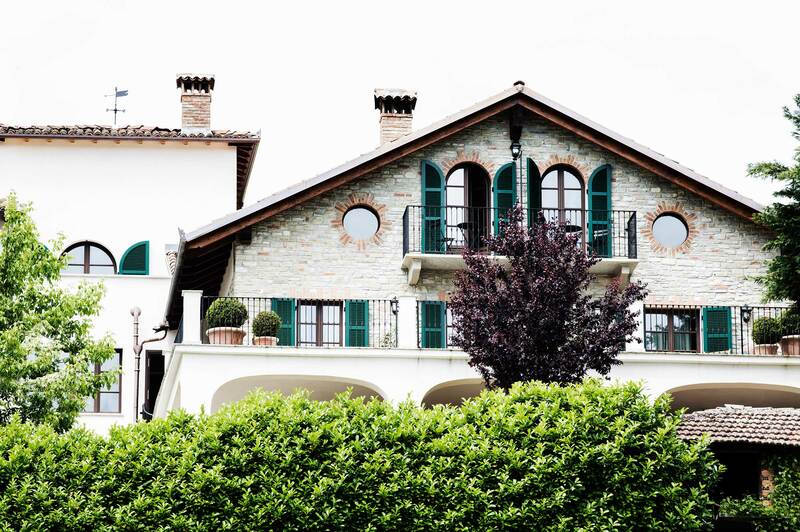 “They get another insight into our products.” Villa La Madonna is a case in point. When it opened in April 2015, it featured a range of test rugs produced by Bolon. Unlike the woven vinyl flooring that the company made its name with, these rugs featured vinyl mixed with different type of textile fibres, creating beautiful patterns and a warmer, softer feeling. Materials from the prototype collection from Villa La Madonna play a vital role in Bolon’s 2017 concept, which highlights the innovative process of the company’s research and development team.